When I was 10, I started performing in musicals and at 11, I was in a Longwood Opera production of Gianni Schicchi. At the cast party, a very tall slender African American man was talking to my mother. Another man came up next to him and was introduced as his "lover." Of course I knew what they meant, but I'd never seen someone who was gay. Not in any book, or Disney movie or TV show. This was a first for me. It was the first time in my childhood I didn't think there was something wrong with me. In Erie, IL last week, the Erie School Board voted to ban Todd Parr's The Family Book from its elementary school. The book tells young children that families are different. It speaks of large and small families, families with of different ethnicities, single-parent families, families with adopted children and then, of course, the most terrifying of all: "Some families have two moms or two dads." It's this single line which caused such a stir in Erie, Illinois, that the school board has taken the book off the shelves. Parents called and complained that children that young should not be taught this kind of material. It's okay if it's taught to older children, but not younger kids who are potentially picking on other kids because they have two moms or two dads. It seems that due to the complaints of just a few parents, the Erie School Board, led by School Board President Charles Brown decided to ban the book. There are several problems with this move by the school board. It's no secret that the topic of anti-gay bullying has taken center stage in the past year. And along with Todd Parr's book, the board has also removed important anti-bullying literature from the school, including guides for teachers on how best to deal with students who may be contemplating suicide. There is an assumption being made by school board president Brown that elementary-aged children are too young to grasp the idea that their classmates may have parents who are the same gender. The American Psychological Association has published conclusive research on lesbian and gay parenting and stating quite concisely that there are no measurable differences between the emotional and physical well-being of children of gay parents vs. children of heterosexual parents. The only real exception being that children of gay and lesbian parents face more harassment from their peers because of their parent's sexual orientation. This won't be solved by a school board president denying the very existence of these kid's families. As the grown son of a lesbian couple who attended public K-12, this is both frustrating and frightening. For the board of a school district to say that my family structure is an 'issue' that shouldn't be included 'at the elementary school level' not only fails to explain why that's the case but also alienates the students in that district who do have two moms or dads. This is another startling reminder of the fact that not all bullies are just adolescent kids: some of them grow up to be school board presidents. 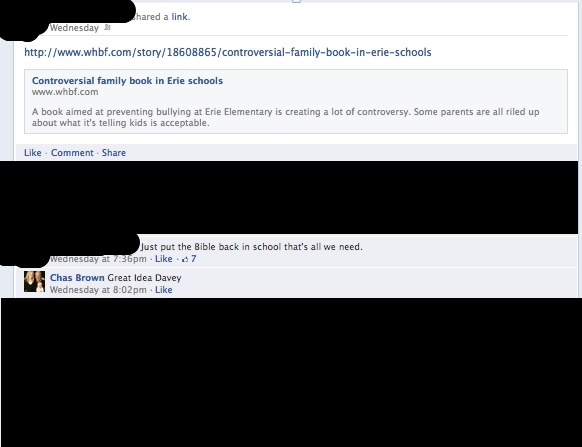 Additionally some educators from the elementary school where the book was banned made statements. They spoke on condition of anonymity as they feared they couldn't do so publicly without risking their jobs. As an educator at the elementary, I am very disappointed that the GLSEN materials and Todd Parr books won't be used again. They were excellent resources for the diversity unit and completely age appropriate. At no time was there anything mentioned that was inappropriate. The elementary level is the perfect time to teach acceptance and respect for everyone and all types of families. I am also very disappointed that these materials were taken away from everyone due to a small group of parents that opposed it. The best option would have been to leave the materials in place and those that wanted their children to opt out do so. By banning materials and books, we are not moving in the right direction. I am very saddened by the whole situation!